Peter Dabrowski is a composer and musician with a wide range of musical styles ranging from classical piano to ambient electronic. After some family members and close friends developed cancer he decided to try and help support specific cancer organisations that research treatments and cures. Not having any medical skills and still wanting to actively do something useful, he realised that the one thing that I did have was his archive of musical compositions. 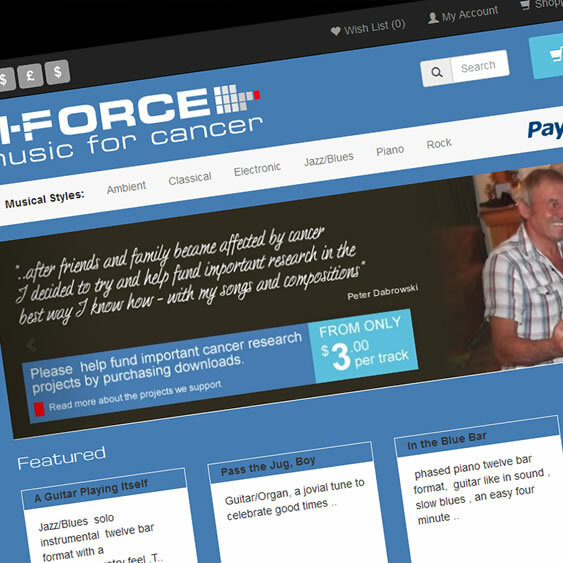 M-Force Music for Cancer offers a wide range of Peter's compositions in MP3 format. Each track can be downloaded for a small donation with each donation going directly to Cancer research. M-force music runs on a customised mobile friendly version of Open Cart. I also developed a special facility to preview play a shorter copy of the main tracks stored in the protected "post purchase" download area of Open Cart.